After Windows 10 have been released, many vendors have released new drivers to be compatible with the Windows 10. Creative also released many new hardware drivers and already submitted them on their website. The updated hardware drivers including webcams, gaming headsets, sound blaster and sound cards. When you used Creative hardware device for a long time or you upgraded system from Windows 7, 8, Vista to Windows 10, you can download and update the Creative drivers in two ways. When you are using creative products such as sound blaster audigy 5/rx or sound blaster pro-gaming in windows 10 system, the updated driver of these devices will bring you perfect performance. 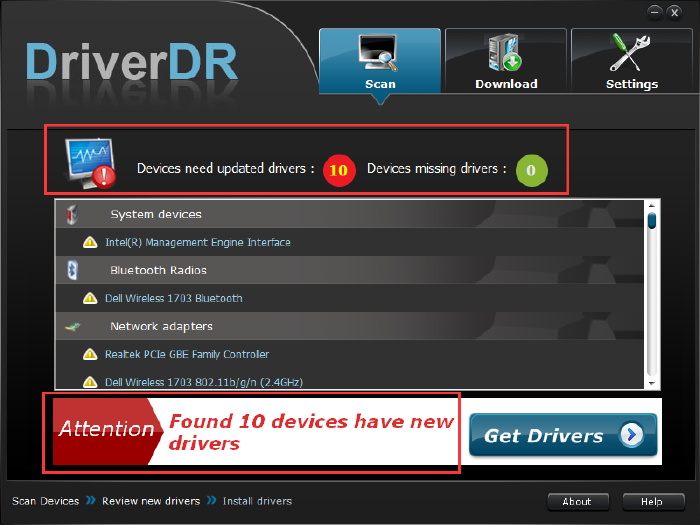 We recommend you a kind of driver updating tool, Driver Doctor. It is very safety for Windows operating system. Driver Doctor can help you to solve all driver issues including downloading or installation for Windows 10, 8, 7, vista system. Its proprietary One-Click Update technology not only ensures that you have correct driver versions for your hardware, but it also creates a backup of your current drivers before making any changes. It’s very fast and convenient for you. Step 1: Click the Scan Now button after you installed and run this tool. The scan process is to scan all hardware devices of your computer and information of accessories drivers. It will identify your hardware drivers and check whether they are the latest version, outdated or missing. Step 2: Click Get Drivers. This action will let you know which driver is need to download and update. Step 3: Download drivers one by one or directly press Download All button. If you upgrade your system from Windows 7, 8 to Windows 10, there will be many drivers need to be updated. Please choose the hardware driver or accessory driver you want to update. For example, If the Creative sound blaster Audigy 5/rx or Creative sound blaster Xi-fi Titanium have a new driver version, please download it. For the Creative sound blaster drivers, we suggest that you had better update them when Creative have new drivers. 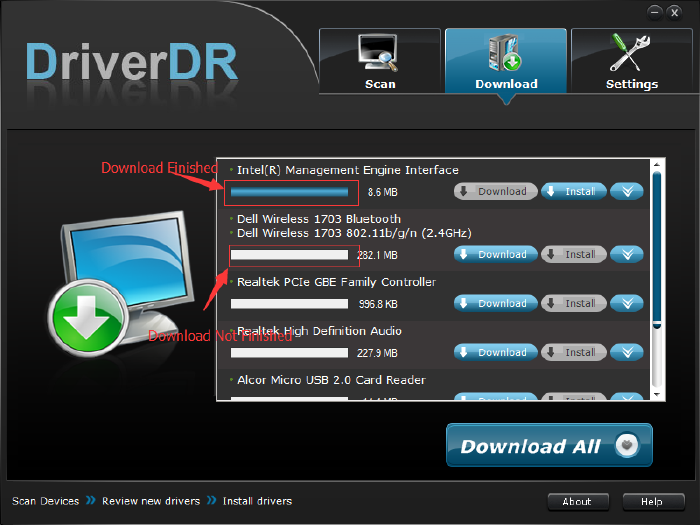 Step 4: Download drivers finished, click the Install button to install these drivers. If you want to download drivers from the official site, you can download sound blaster drivers from the Creative website. Step 1: Go to Creative Drivers website. On this page, you can find all Creative hardware drivers support Windows 10. And Creative said if you want to find other driver/software, you can view the support page. Step 2: Catch the hardware driver which you used. If you want to update the Creative Sound Blaster Audigy 5/rx driver, you can find it from Sound Blaster table list. You can see sound blaster audigy 5/rx model number is SB1550. Step 3: Click Download Now button. You can go into Sound Blaster Audigy 5/rx driver download page. Step 4: In the download page, the driver is on the top of the list. Click the Download button and download it. The driver download contains file size and release date. Here you can see this driver file size is 263.32MB and released on 28 Jan 2016. It supports Windows 10 32bit and 64bit. Tips: Click the Show Details you can learn more information about sound laster audigy 5/rx software pack for windows. The details show you the driver file name, requirements and notes if you install it. Step 5: you selected the Download, you can enter to Creative End-user Software License Agreement page. You need to answer verification question correctly and then click Agree button. Then start to download the driver. Finally, it is downloading the driver file to your local disk. Finished, follow the guideline to install it. In this way, you can also download and update Creative Sound Blaster Xi-Fi drivers and other drivers for the safety of Window10. Well, the above methods can help you update creative drivers for Windows 10. And here you can also using Windows automatically update drivers for Windows 10.